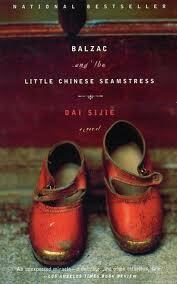 I love buying non fiction books. Reading them — well that’s another story. My bookshelves are crowded with business books and books on world issues that I bought fully intending to read but never actually doing so. Rachel Carson’s environmental classic Silent Spring has formed a very cosy relationship with Edward de Bono’s Six Thinking Hats and Charles Handy’s The Empty Raincoat over the years the three of them have nestled on the bookshelf. At least I’ve opened the Carson book which is more than I can say about The Dragon and the Elephant: China, India and the New World Order. Out of the ones I have managed to read, here are a few of my favourites. Greg Mortenson was a registered nurse and mountain-climber whose life was transformed when he lost his way descending the K2 mountain in Pakistan. He was saved by villagers who nursed him back to health. As a thank you he pledged to build them a school. 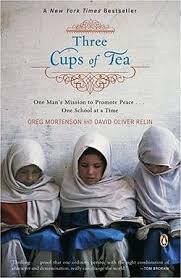 Eventually he raised enough support to build not one but 55 schools in the remote and troubled region and Mortenson became a humanitarian committed to reducing poverty and promoting education for girls in Pakistan and Afghanistan. The veracity of Mortenson’s account has now been challenged unfortunately but this is still a good read. This is a magnificent biography of a man whose diaries give us an eye witness account of the tumultuous events of sixteenth century England. 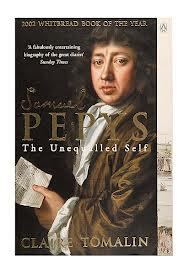 The execution of a King, the Great Plague and the Fire of London, Pepys lived through them all, sometimes fearing for his own life but somehow surviving and thriving in fortune and status. Tomalin’s biography reveal the multi faceted man who was a superb naval administrator as well as a bon viveur. In part this is a travelogue, but it’s also a memoir and a journalistic essay on the nature of one of the fastest growing cities in the world — Mumbai. Mehta was born in the city but lived most of his youth in North America. 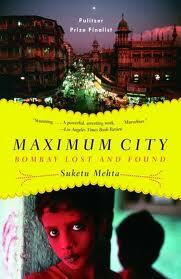 On his return to Mumbai he turns an uncompromising eye on the nature of the city. At times it’s a hilarious rendition of the frustrations of living in this city – a place he labels The City of No simply because, no matter what the question, the answer will invariably be no. It’s also a city whose inhabitants cope with its phenomenal increase in population size by ‘adjusting’. The train may be full to the brim but there is always room for one more if everyone inside just budges up a bit. Other times, the sheer impossibility of getting anything done make you question whether this country can ever really rival China as an economic superpower. There are some books that begin with a definite punch even if they are not always of the Hitchcock idea of a brick-through-the-window start to films. 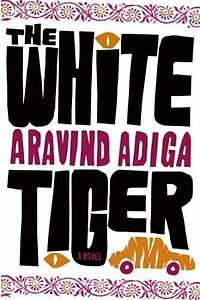 In White Tiger by Aravind Adiga the punch isn’t delivered by an event but through a narrator’s voice that is so direct and immediate, that it demands attention. We don’t know who this narrator is yet other than he calls himself ‘the White Tiger’ and classes himself as one of India’s successful entreprenneurs. But he clearly thinks he’s important enough to write letters to the Premier of China advising him what to expect when he pays a State visit to Bangalore. His letters are filled with scornful comments about the reality of life in India – a side to the country he believes the Premier will never see. For this narrator not only considers himself a great man just as much as the premier is, but the only person the Premier can trust to tell the truth. India’s most sacred river, the Ganges, is one of the myths he smashes. One fact about India is that you can take almost anything you hear about the country from the prime minister and turn it upside down and then you will have the truth about that thing. Now you have heard the Ganga called the river of emancipation ……our prime minister will no doubt describe it to you that way and urge yuo to take a dip in it. No! – Mr Jiaboa, I urge you not to dip in the Ganga, unless you want your mouth full of faeces, straw, soggy parts of human bodies, buffalo carrion and seven different kinds of industrial acids. Gradually, we learn that this outspoken critique of his mother country is Balram Halwai, son of a rickshaw wallah born in The Darkness, the poorest and most deprived part of India. Halwai gets an escape route into the other India, the India of Lightness, when he manages to get a job as a driver for Mr Ashok, the son of a wealthy landlord. Through this outspoken, murderous protagonist, Aravind Adiga shows us the underbelly of India and the reality of its powerhouse economy of the early 21st century. Pouting models from the west may adorn the facades of new gleaming glass shopping malls but around the corner, are the slums where people live under meagre tarpaulin roofs. Through Balram’s eyes we learn of the servant class of Delhi who live in rotting basements below the glass apartment blocks that are home to their employers. He tells how Ashok’s family bribe government ministers, and how national elections are rigged. Balram realises he has to take destiny in his own hands. His employer is liberal and freely expresses his guilt at his driver’s treatment but when his fine words never come to anything, Balram decides to kill him, steal his money and then go on the run. Maybe no-one likes the country of their birth and the country they are proud of, to be held up for scrutiny in this way so those reactions are understandable. More of an issue for me was that the book seemed to lose its way in the final stages, about the time when Balram commits the murder – we already know it’s coming so it had the sense of inevitability. Having told us how the killing is executed Adiga seemed to be in a great hurry to get to the last page as if he’d had enough of this character. So it felt a rushed and somewhat predictable ending which was such a shame for a book I’d thoroughly enjoyed up until then.